Recently I shared my 4 GB SanDisc pen drive for transferring some data from my PC to a laptop. I knew that the laptop was infected with viruses. I did not hesitated about sharing my pen-drive because I was quite confident that AVG antivirus will take care of any migrant virus. I generally use AVG Free for home use version. Its as good as paid version of Norton AntiVirus and McAfee Anti-Virus software. If at any time the viruses doom all anti-virus software, I switch to Linux OS, mainly to Ubuntu OS or Kubuntu OS. When I got my pen drive back it showed all folders as shortcuts and AVG detected malicious programs on it. After AVG scanned my pen-drive and applied preventive measures all the data disappeared from pen drive. At first I thought of formatting the pen-drive but on second thought, I searched google for recovering data from virus infected pen-drive and got a working solution. Which I am sharing here in this blog post for you and for my own reference in future. Assuming that your computer is run on windows platform like Win XP, Win 7, Windows 8 etc. 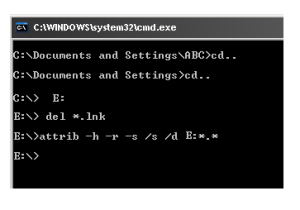 Step 2. type CMD in open command form. Now wait for 1 to 2 minutes and then open your pen drive in My Computer window. hopefully you will see all the data is still present in your pen drive. Step 2. if your USB drive letter is E drive under My Computer window, then you need to type E: and press Enter key. Now you will see E:/> which is the USB drive inside the command prompt. From above command line it is clear that AVG antivirus alters the folder’s view properties. In India online stores have sprung up like anything. There are so many TV commercials being run to promote these stores like, Myntra, Jabong, eBay, Snapdeal, Naaptol etc. It was my birthday in second week of April and I opted to buy some accessories for myself. I mostly choose online shopping for ease of connivance that you don’t have to go out in summer heat and also it saves on car gas costs. I decided to buy Casual shoes and Sunglasses for myself as a Birthday gift. Usually I wear slip-on leather shoes but this time I was determined to find a slip-on type sport shoe for myself. I use coupons to get discounts on items I purchase online. I found two coupons from sites like desidime and coupondunia. One was of value Rs.200 on buying items above Rs.1000 and other was of value Rs.500 on buying items above Rs.2000. Discounts? Keep on reading the article, you will come to know about the trick these stores play on you. I searched a few online stores and selected one slip-on type shoe from Fila brand. It was priced at INR Rs.1899 other was priced INR Rs.1999 . 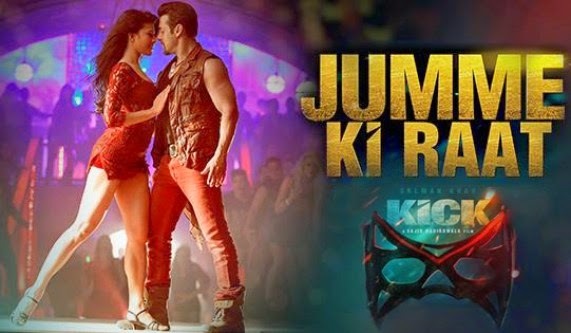 I called up Jabong customer Care number and asked whether INR Rs.500 discount will be available on item priced INR Rs.1999. The lady was neither answering in denial nor in affirmation, but after some pressure talk she said you have to buy item above INR Rs.2000 value to get INR Rs.500 discount. Then I used INR Rs.200 discount on item priced at INR Rs.1899. This item was listed for free shipping in my area and I opted for COD (cash on delivery) mode of payment, for which they charged INR Rs.39. 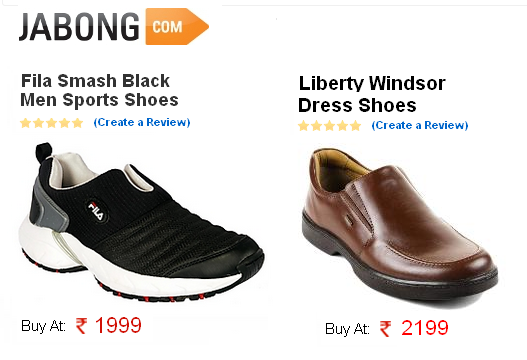 Now the effective discount on this shoe was only INR Rs.161. I wear UK size 40 cushioned shoes and usually same size of sports shoe fit me. So I ordered size 40 Fila smash III black shoes from Jabong.com. I was surprised that order was delivered within 24 hours at my residence and payment was collected by GoJavas courier boy. After opening the parcel, I tried the shoes and found out that these were very tight and felt quite a bit of pressure on my big toe. My mother said, ”it might be hurting you because these are new shoes and you have not been using sport shoes from quite some time”. Wearing Fila shoes, I walked around for about 5 minutes on the carpeted floor. It was not getting comfortable at all, so I decided to call back the customer care at Jabong.com and asked about the exchanging the shoes. At first the customer care guy told me that I have two options, either I can return the item and get refund or get it exchanged with any other item of same value. I was determined to buy myself some accessories on my birthday, so I chose to get another item from them. I ordered Liberty Windsor shoes priced at INR Rs.2199. There was shipping charges of INR Rs.99 on this item so they deducted the price of Fila shoes and added the shipping charges and once again INR Rs.39 for COD mode of payment, which turned out that I have to pay INR Rs.299 on receiving Liberty Windsor shoes. In actual the shoes cost me INR Rs.1788 + Rs.300 totaling INR Rs.2088 with an effective discount of INR Rs.249 on total cost of Rs.2337. Whereas last year, I bought the same shoes from a shoe store at Sector 19, Chandigarh for INR Rs.1300 when it had a MRP of Rs.1890 at that time. That was huge discount of Rs.590. Now you can judge yourself how online shopping makes you feel. The second gift for birthday was decided to be a good quality branded sunglasses. I saw a listing on ebay.in where a seller was offering huge discount on genuine Reebok sunglasses with 100% UV protection and he also offered to refund if the product received is found to be not original. Normally ebay merchants go extra mile to satisfy the customers and receive a positive ratings from customers. 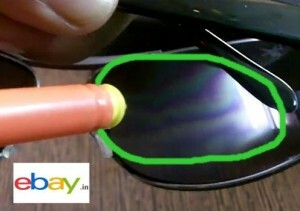 Believing the claim made by merchant from Gujrat, I purchased the Reebok sunglasses. The Sunglasses arrived on my Birthday and I went to my friend’s place where my friend pointed out the reflective distortion of these sunglasses and we came to know that it was dead cheap duplicate item. The visual optics was delivering distorted vision and it did not took long that I got headache. On returning home I wrote to the merchant and posted photos of the poor quality Sunglasses and asked him to refund my money. Yesterday I have sent the Reebok sunglasses back to merchant via DTDC Courier Company and it costs me INR Rs.90 for it was 300 gm parcel. In the end, I did not felt much pleased with online shopping. imo is an instant messenger that allows you to chat on Skype, Facebook Chat, Google Talk, MSN, ICQ/AIM, Yahoo, Jabber, Myspace from a single place. 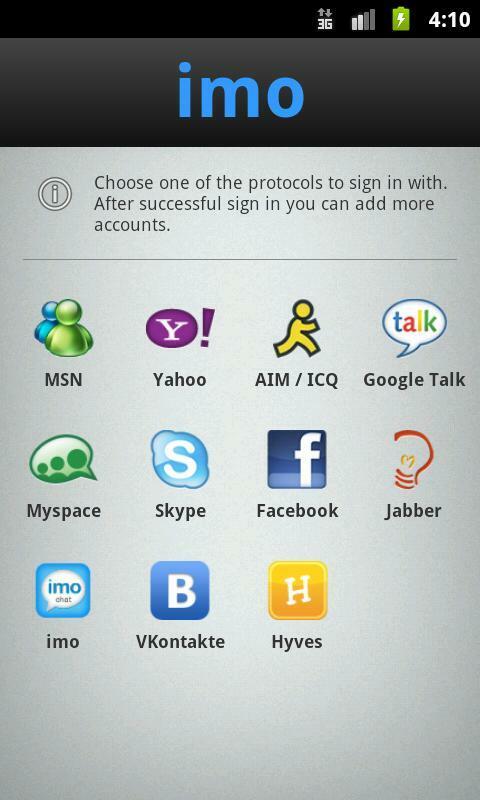 imo allows yout to stay in touch with friends on your existing IM accounts. The app won the About.com’s 2011 Readers’ Choice Award as a Best Free Android App. 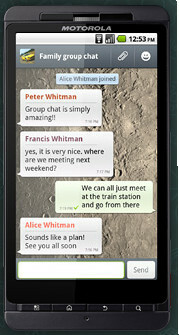 WhatsApp Messenger is a smart-phone messenger available for Android, BlackBerry, iPhone, Windows Phone and Nokia phones etc. WhatsApp uses your 3G or WiFi (when available) to send message to your friends and family who also have Whatsapp messenger installed on their phone. 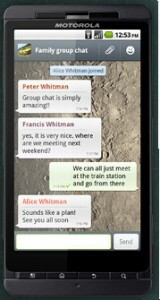 Switch from SMS to WhatsApp to send and receive messages, pictures, audio notes, and video messages. • NO HIDDEN COST: Once you and your friends download the application, you can use it to chat as much as you want. Send a million messages a day to your friends for free! WhatsApp uses your Internet connection: 3G/EDGE or Wi-Fi when available. • MULTIMEDIA: Send Video, Images, and Voice notes to your friends and contacts. • GROUP CHAT: Enjoy group conversations with your contacts. • NO INTERNATIONAL CHARGES: Just like there is no added cost to send an international email, there is no cost to send WhatsApp messages internationally. Chat with your friends all over the world as long as they have WhatsApp Messenger installed and avoid those pesky international SMS costs. • SAY NO TO PINS AND USERNAMES: Why even bother having to remember yet another PIN or username? WhatsApp works with your phone number, just like SMS would, and integrates flawlessly with your existing phone address book. • NO NEED TO LOG IN/OUT: No more confusion about getting logged off from another computer or device. With push notifications WhatsApp is ALWAYS ON and ALWAYS CONNECTED. • NO NEED TO ADD BUDDIES: Your Address Book is used to automatically connect you with your contacts. Your contacts who already have WhatsApp Messenger will be automatically displayed. • OFFLINE MESSAGES: Even if you miss your push notifications or turn off your phone, WhatsApp will save your messages offline until you retrieve them during the next application use. • AND MUCH MORE: Share location, Exchange contacts, Custom wallpaper, Custom notification sounds, Landscape mode, Precise message time stamps, Email chat history, Broadcast messages and MMS to many contacts at once and much more. Nimbuzz Messenger combines internet and smart phone messenger into one and you can make free voice calls, send messages, share files on any mobile device across popular Instant messengers like YIM, Gtalk etc. 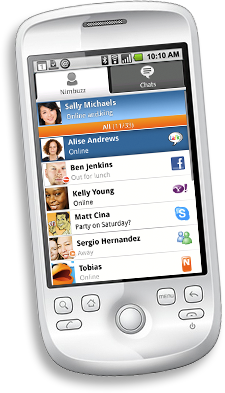 Nimbuzz Messenger is available for Android, iOS, Blackberry, Symbian, OVi Store for Nokia, Java, Windows PC and Mac. Nimbuzz Messenger lets you chat with your friends on Facebook, Gtalk Messenger, Yahoo Messenger, Live Messenger (MSN) for free provided you have mobile internet 2G/3G or gprs on your mobile. With Nimbuzz messenger you can share unlimited photos, files, music and videos with other friends of yours on Facebook, Yahoo Messenger, Gtalk Messenger and Live Messenger (MSN). You can also connect with your friends on Twitter using our popular chat buddy. 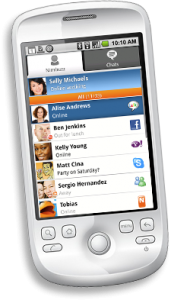 Nimbuzz Messenger is very popular among millions of mobile users having different platforms prove that. Nimbuzz Messenger is available for every smartphone and feature phone, so go ahead and tell your friends to download Nimbuzz Messenger. 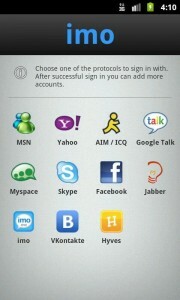 • FREE PUSH NOTIFICATIONS: Appear always online and be available to chat with Push Notifications for incoming messages. • CHAT BUDDIES – Use our popular chat buddies for Twitter, Cricket, Astrology etc. • MORE: Custom chat wallpaper, Landscape mode, Contact sorting, improved Presence Icons, precise message time stamps, Chat history, N-world, free Avatars and much more. WinAmp is Ultimate Media Player for Android phones and tablet PC. Play, manage and sync music from your PC or MAC computer to your Android device. Winamp for Android offers a complete music management solution featuring wireless desktop sync (latest Winamp Media Player required), iTunes library import, & access to thousands of internet radio stations with SHOUTcast. Visit http://www.winamp.com/android to learn more. “The D.I.S.E.C.T.E.D Love GuRu”. What you see is what you get and that memory has the power to create world. Gems of Wisdom should not be corrupted for satisfying your fear of loosing your believes. For the spread of hijacked knowledge leads one towards degradation both in personal and social aspect. Recently, I have compiled a CD of my favorite Bhajans. Matashri also asked me for it and I thought, why not put it on File sharing website. I found MediaFire.com to be most user friendly among file sharing websites. I have tried Rapidshare also but it is not that user friendly. Rapidshare.com just delete your files as and when they desire. without any prior notice. How to send fax via internet for free? Send free Fax to any country. No Ad free fax cover page, send up to 2 faxes per day, 1 page per fax maximum. You can compose the fax online or attach a “pdf” or “doc” document. Send a free fax to over 30 countries. Send up to 2 faxes per day with attachments. The file must not exceed 10MB in size and contain a maximum of 10 pages. Supported files types include Microsoft Word, Excel, PowerPoint, PDF, TIF, GIF, JPEG, etc. Author Param LowePosted on March 27, 2010 Categories Free StuffTags fax, Free, onlineLeave a comment on How to send fax via internet for free? Mohit Singh on eBay is Best shopping website and ShopClues is a Scam.